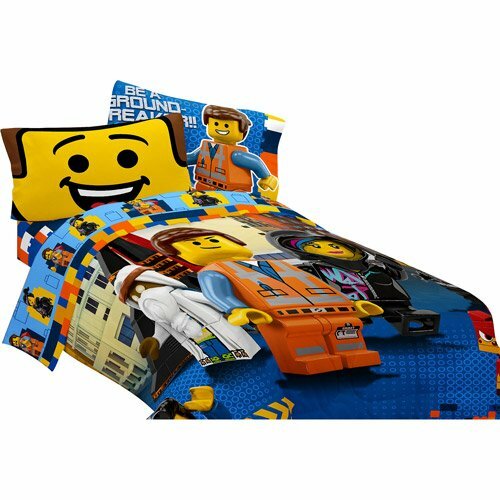 The Most Fun Bedding for Boys! Cute, Colorful and FUN Comforters and Bedding Sets for BOYS! I heard you are looking for some cute and fun bedding for boys? 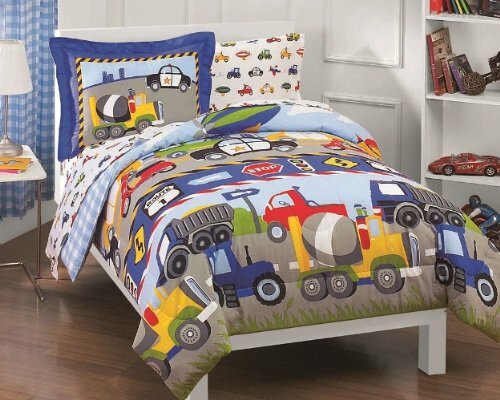 *The one in this picture is a cheerful comforter set for little boys, full of fun cars, trucks and and tractors! Perfect to create a fun ‘boyish’ atmosphere! 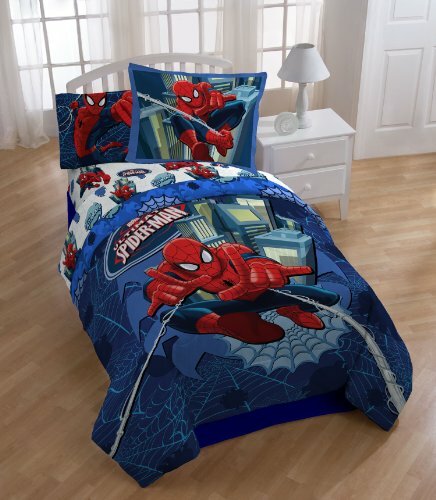 MARVEL Spider Man Awesome Comforter Set for Boys! Of course when we think about fun bedding for boys, one of our first thoughts is ‘Spider Man’! This is a very cool Spider Man full-size comforter set for sale! It’s soft, it’s nice, it’s vibrant and it looks like Spider Man is climbing right into the bedroom! It also comes with the cool pillow shams! *You can also get a cool giant Spider Man wall decal to make the bedroom even more awesome! This is also one of the coolest comforter sets for boys being sold! 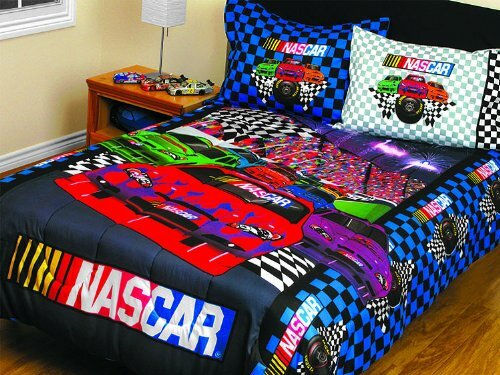 It’s a vibrant Nascar car race theme twin size 3-piece bedding set! Perfect for a 5 or 6 year old boy’s bedroom who also loves car racing! It is so fun and realistic that your little boy is going to think he is inside the movie too! Check out the cute pillow case! It is an 8-piece Phineas and Ferb comforter set for sale! It includes all the sheets, pillow cases, pillow shams and bed skirt! 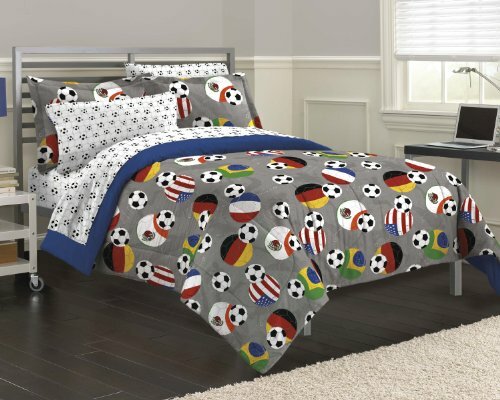 Cool SOCCER Theme Comforter Set for Boys! Does your boy love to play soccer? Then this is the perfect comforter set for him! I LOVE all the soccer balls and different country flags design! This fun bedding set is available in three different sizes and it includes the flat sheets and pillow cases! Great for boys ages 8, 9, 10 and up! Who can be cooler than the Avengers? 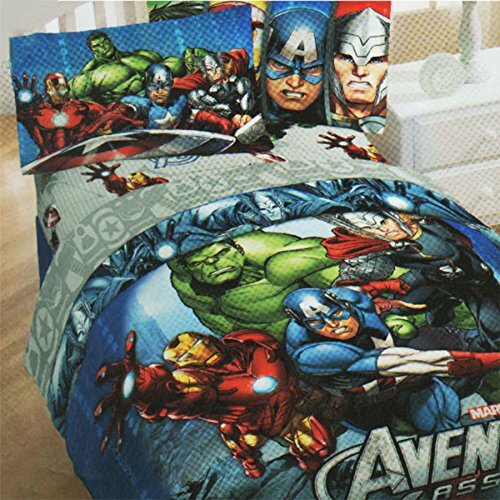 This is a gorgeous Avengers 4-piece twin size bedding set for sale! The print is amazing and very realistic! Great comforter set for boys ages 3, 4 and 5 years old! (He is also going to have the most awesome dreams! 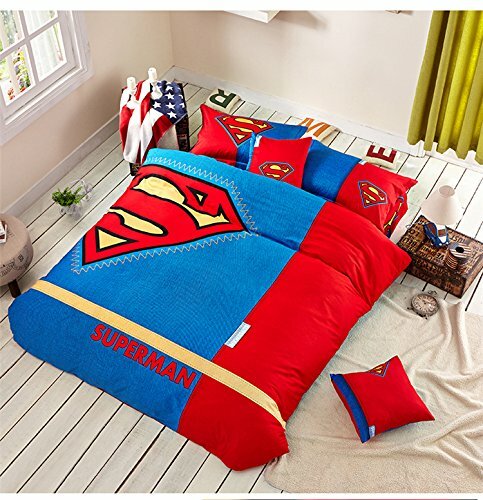 Gorgeous Superman Blue Red Yellow Bedding Set for Boys! Does your little boy think he is Superman himself? Does he go around the house wearing his ‘super’ cape? Then this Superman logo bedding set is perfect! The colors are gorgeous and it comes with the fitted sheets and pillow cases! Stunning Batman Emblem 3 Piece Reversible Super Soft Luxury Queen Size Comforter Set! It’s time for a stunning Batman theme comforter set for sale! The yellow and black color combination is so gorgeous! 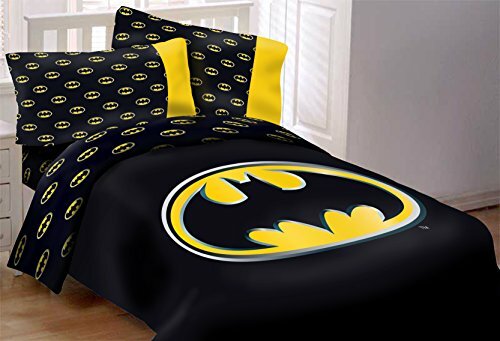 If your little boy loves Batman, then he is going to love having this bedding set in his bedroom! 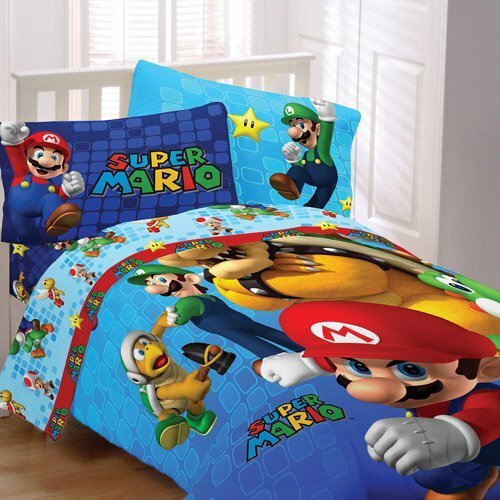 How about a Cute Super Mario Comforter Set? It’s a cute, fun and very colorful Super Mario (and friends!) comforter set for sale! 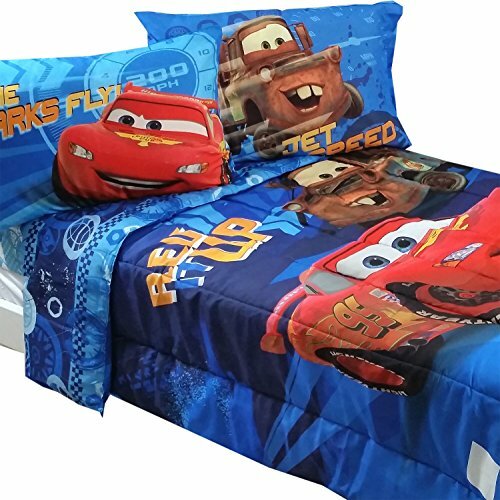 Fun Disney Cars Full Bedding Set for Boys! And last, but definitely not least, it’s a cute and fun Disney Cars 5-piece comforter set for sale! Every boy loves this movie! You can also get a cute Disney Cars matching table lamp too! Here are more fun boys bedding ideas! *Cute Cartoon Bedding for Kids! 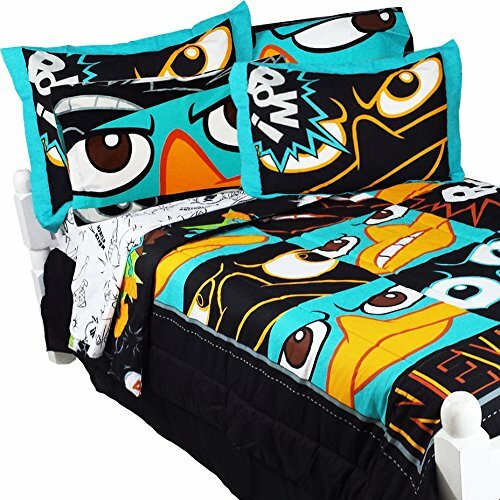 *Coolest Teen Boy Bedding Sets! Hi Pam, thanks for visiting! You can find some on my dinosaur bedding page.